Yesterday, July corn closed down 10-1/2 at $3.77-1/4 and December corn down 10-1/2 at $3.95-1/2. July soybeans closed down 10-1/4 at $9.31-1/4, and November beans also dropped 10 to $9.38-1/4. Farmer selling last week, the forecast turning to include wet weather and forecasted temps in the 80’s was the stimulant to drive markets lower. Wheat took a tumble, adding additional downward pressure after the rain in northern plains aided spring wheat. Corn and beans recovered some losses on the overnight; assisted by export inspections coming in strong for both corn and beans yesterday, both above the numbers to meet USDA forecasts. 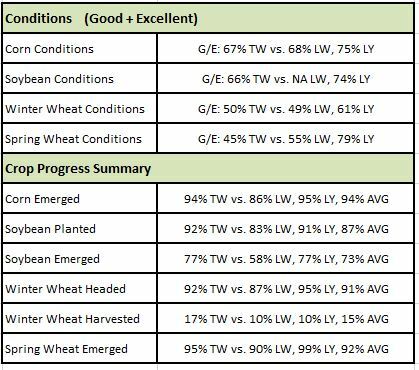 The crop condition report came out yesterday afternoon giving some boost upward on the overnight. Bean trade was expecting about 68% to 70% good/excellent rating and came in lower at 66%, and corn trade expected 67% to 68% good/excellent, and it settled at 67%, down a 1% from last week. Included also is the seven-day forecast, which runs through June 19, has rain totals of two inches or more for much of the Midwest. 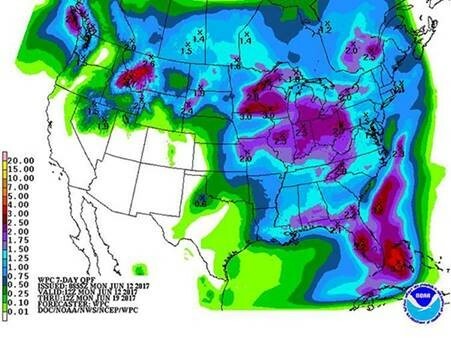 Iowa and the Dakotas are expected to have an inch or more.